The battle for the next Masterpiece Optimus Prime continues. Hasbro is bringing us the new official Masterpiece Optimus Prime Version 3 and Transform Element has shown color images of upcoming TE-01. Now, Magic Square Toys is showing off color images of their MS-01 Masterpiece Scaled G1 Optimus Prime via Aludardlee Weibo account. 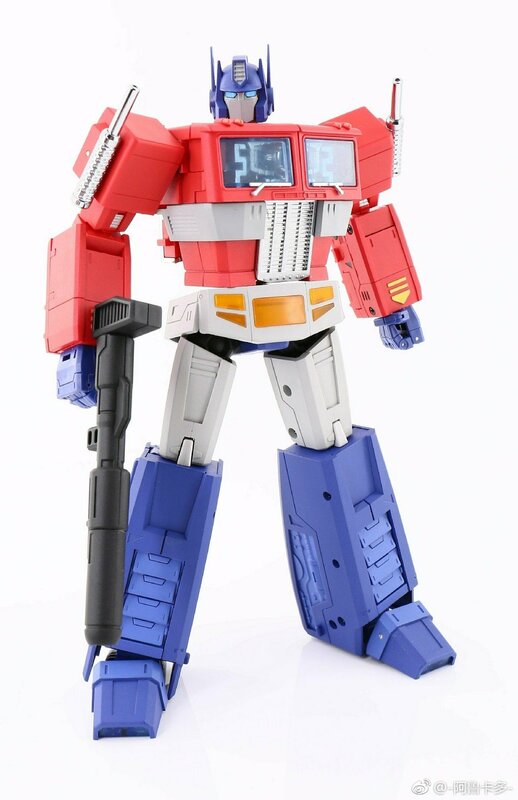 Magic Square Toys is a new 3P company which stated making some Legends scaled figures, and surprised the fans when they announced their first prototype a few days after we saw the first images of the official Masterpiece Optimus Prime. What do we have here? A very solid representation of the Autobot leader, trying to catch the classic G1 cartoon design. This means they wheels of the truck are integrated and hidden in the alt mode. Articulated fingers, nice proportions and a small backpack. 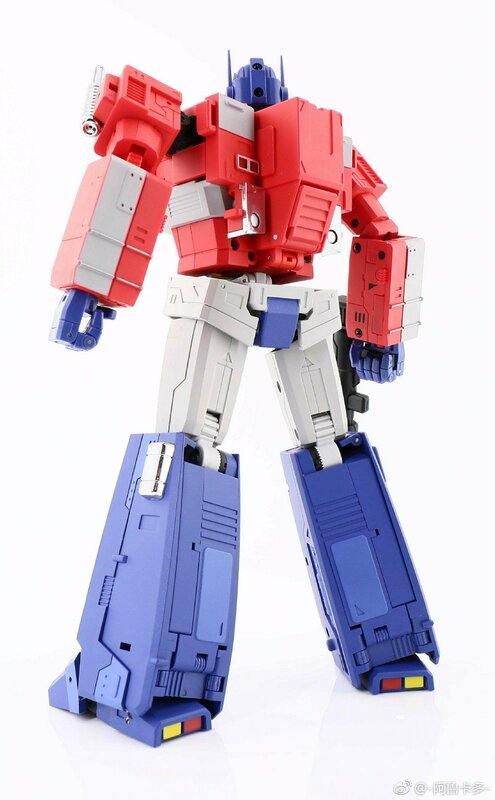 We are sure fans will like what Magic Square is offering, and we have another great alternative for the ultimate Masterpiece Optimus Prime mold. You can check out the new images, including a video showing off the articulation of the toy (thanks to Hobbymizer Hong Kong Group On Facebook), after the jump and then sound off on the 2005 Boards! It was suggested to me by a guy who builds Gundam models. I suppose that it holds out pretty well. But then again, it wouldn't be difficult at all to clean it off and redo it. The pens are water based. It doesn't take much to clean it off. Have to be careful with it until it dries tho or you can rub it off. Let it dry and give it a good clear coat and you should be fine. I've used everything from gel to professional ink pens to Prismacolor markers, lol. As long as you finish it right, it's all good. Nice! I'll have to track some down and do some experiments. Working with pens is so much easier than brushes. Cool! Got a link or the name of the pens? That looks great! I wonder how durable it is though – those pens are intended for paper so I'd be a little worried about how they hold up on plastic. I really like that custom Megatron head. The helmet could probably be a little more rounded as to give the effect of smoothness like it was in the animation but other than that, so much better than MP36 or any other MP Meg's available. Am I the only person that thinks they should release a replacement set of hands for these guys, because their hands are a bit too big and would look better if each finger was of a different length to one another. It\'s just that those hands are too big and unatural. I\'m okay with the blockyness of them, it inkeeping with it\'s aesthetic, which is a bit chunky and blocky, but the hands should just be a bit more refined. Same. I moved mine up to my Optimus/Megatron shelf. Guess I need to list my MP-10 for sale at some point now. Do we know if the red is metallic too or is it just the silver and blue that got that treatment? I can't tell despite how many times I look at the pics. This pic suggests that the red is glossy, or glossier than the standard version. The metallic version is on the left. I try to not put too much credence into what any prototype looks like, and wait to actually see the final product to see what it really is. How it actually turns out. That pic shows that his head is metallic blue but not the antennas on the sides? I kinda doubt it will actually come out like that. Nice. I think that's how I want to add the yellow arm details on to the metallic version when I get it. Painting in yellow is always such a pain. That looks great. I was thinking I may want to make the yellow bits on his waist like that. Did you paint that, or are those decals you made?